Location of Lithuania. Source: CIA World Factbook. (FPRI) — On October 9th Lithuania will hold parliamentary elections. With no major mobilizing issue or charismatic persona in the race, the populace is expecting more of the same. 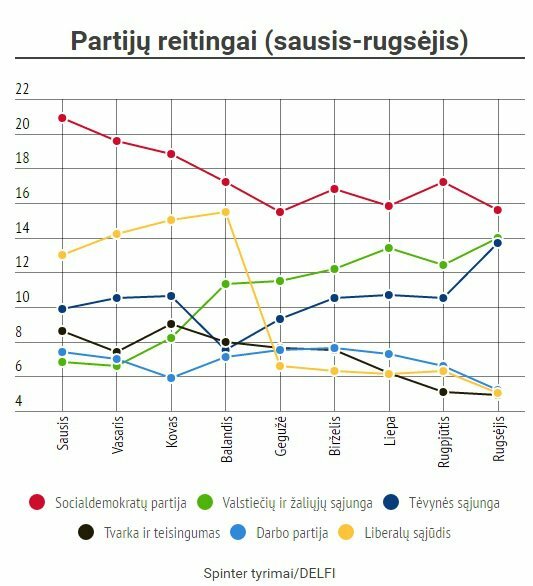 The governing Social Democrat party (Socialdemokratai) continues to lead in the latest polls with 16%, while at the same time 59% of respondents say they disapprove of the policies of the current government. Social Democrats have remained unpopular throughout their four-year term: ministers and influential members of the party were frequently criticized for corruption and favoritism in several public tenders, and the less-than-stellar public speaking skills of prime minister Algirdas Butkevičius are subject to countless internet memes. However, despite the gradual infusion of younger and more progressive political figures into the political scene, no other party has managed to position itself as a sufficiently credible and appealing alternative to the Social Democrats. In May of this year, an ongoing Security Services’ (STT) investigation into widespread political bribery by MG Baltic Group, one of the country’s largest local retail-wholesale businesses, implicated several prominent political figures. These major corruption scandals bear much of the blame for the current stagnant electoral climate, leaving lingering disillusionment with the political process as a whole. First, allegations of bribery dealt a deadly blow to the Liberal Movement (Liberalų Sąjūdis) – formerly the second most popular party after major wins in the 2015 municipal elections, and a stronghold of supporters in Vilnius. Advocating a leaner government, a labor code allowing more flexible hiring and firing practices, and vocally supporting LGBT rights, the party was favored by urbanites, progressive intellectuals, and young entrepreneurs. In mid-May, the Liberals’ leader Eligijus Masiulis was questioned for allegedly taking 106,000 EUR in cash from MG Baltic Group in exchange for political favors. Masiulis swiftly withdrew from the party, but the interim chairman Antanas Guoga – a member of the European Parliament who had made his fortunes in a gambling business – also resigned within days, following PR gaffes and a failure to garner internal party support. These events resulted in a dramatic loss of face for a party that had positioned itself as an alternative to the old systemic cronyism and prided itself on its modern values. Liberals were not the only ones caught up in the bribery scandal, however. Later in May Vytautas Gapšys, the deputy leader of the populist Labor Party (Darbo partija) faced allegations of receiving 25,000 EUR in discounts for political advertising on the media controlled by the same MG Baltic Group in exchange for pushing legislation favorable to the company. Investigation of this large political corruption scandal exposed the involvement of the head of the State Food and Veterinary Service in a cover up of the presence of listeria at a major frozen goods manufacturer, Judex. The food company was revealed to be closely linked to Petras Gražulis, member of the populist Order and Justice Party (Tvarka ir teisingumas). STT’s efforts to shed more light on this far-reaching network of corruption have strengthened the impression that everyone across the political spectrum is tainted. Over the summer public discussion of the upcoming elections effectively ceased. Most parties are barely investing any money into campaigning, with candidates largely sticking to door-to-door campaigning and ribbon-cutting ceremonies, as they are keenly aware of the possibility of being swept up in another scandal. September marks the season of public debates, and laudable attempts by a number of opinion leaders to flesh out the content behind different party programs and encourage voter participation. With only days remaining before the election, one prominent commentator went as far as to encourage the supporters of Liberal and Conservative parties to reach out to people they know to hold opposing political views and, instead of trying to convert them, simply urge them to vote for the “lesser evil” among the choices at the other end of the political spectrum. Several prominent journalists and youth activists undertook a new initiative, volunteering to organize and moderate public debate events among local candidates in 59 of the country’s provinces. Many of these journalists subsequently noted the lack of quality content, with competing candidates unable to describe any major achievements from their time in office, yet making the populist promises of welfare increases, raising pensions and wages, and initiating education reforms. They were not able to identify how they would fund these new initiatives, but categorically rejected tax increases. The Institute of International Relations in Vilnius (TSPMI) curated another notable new initiative – public forums for political parties to launch their official electoral programs, with critical assessments by prominent academics. In addition, for nearly a decade TSPMI has also been running an online questionnaire manobalsas.lt (“my vote”) designed to show respondents which political party most closely matches their values and views. In the national debates traditionally held on live TV, the five leading parties focused on the usual questions of how to stimulate the economy, attract foreign investment, and stop mass emigration and encourage return of the diaspora. Traditional family issues – such as the treatment of LGBT couples, abortion, and the country’s demographic decline – were also high on the electoral agenda. Following these televised debates, most analysts pointed to Gabrielius Landsbergis, the chairman of the Homeland Union-Lithuanian Christian Democrats (Tėvynės sąjunga – Lietuvos krikščionys demokratai), as the most serious challenger to the sitting prime minister. The grandchild of Vytautas Landsbergis, who was head of Sąjūdis and of one of the most seasoned politicians in Lithuania, cut his teeth as a young politician at the European Parliament. Together with other Christian Democrats of his generation, he is now vying for the votes of the former supporters of the Liberal Movement. His image of a progressive stands in contrast to the party’s hard line on socially conservative family values, a position that risks losing the votes of people under the age of 45 because of issues like abortions and LGBT rights. Meanwhile, the Peasant and Greens Union (Valstiečių ir žaliųjų sąjunga), though lacking in charismatic personalities, seems to be quietly gaining popularity by simply staying out of the limelight. The Peasant-Greens have gained popularity in the provinces by actively promoting sobriety- given that alcoholism is a big problem in rural Lithuania – and are seriously vying for the second place with the Christian Democrats. With an electoral platform promising to recruit private sector professionals for ministerial appointments, the Peasant-Greens will likely be decisive in shaping a coalition government together with the Social Democrats. Despite the widely perceived rise in the level of threat and mounting provocations from Russia over the past several years, national security and defense questions are not considered key election issues. The military was never a popular institution in Lithuania, with lingering horror stories of Lithuanians who served in the Soviet army and strong support for the concept of peaceful resistance. Mounting pressure to meet NATO’s 2% GDP defense budget requirement and recent reintroduction of conscription was already a stretch. At the end of August, another unfortunate instance involving incompetent public procurements surfaced. Dubbed the “golden forks’ scandal,” it became known that a large portion of the first increase in the national defense budget in 2014 was spent on procuring kitchen utensils for the field units – rather than investing in arms or military equipment; in addition, it turned out the utensils were procured at tens or hundreds of times the market rate. This further damaged the image of the military in the public eye, making further defense budget increases an ever harder sell. Nevertheless, there were also positive developments regarding military policy. These included defense and security policy items making it into electoral programs of the Peasant-Greens and the Liberals for the first time. Traditionally, only the Social Democrats and Christian Democrats had a public stance on defense. Another laudable development was a public debate at Vilnius city hall on national security issues, with candidates across the political spectrum running in the Old Town (Senamiestis) constituency. Most of them identified the need for greater civil engagement and awareness of geopolitical issues as the top national security priority, and failure to participate fully in the European project as the greatest long-term threat. Interestingly, candidates who actively address defense and security issues are mostly former members of Sąjūdis, the movement famed for victorious peaceful resistance to the Soviet Union, who are now in their 50s-60s, and are concentrated in nationalist political parties that typically attract no more than 1-2% of the vote. Many of these figures favor introducing military training and civic education promoting national pride at schools, and otherwise look to promote a strong Lithuanian identity, which sometimes deteriorates into extremes. Overall, these parliamentary elections in Lithuania will likely see a low turnout and result in a coalition government, continuing with conservative economic policies and limited change regarding defense policy. The country will have to wait another four years for a party or a politician with a visionary agenda that could mobilize voters and lead to systemic change. *Egle Murauskaite is a Nonresident Fellow with the ICONS Project at the University of Maryland. Her research is focused on international security issues and unconventional threats, particularly those related to CBRN weapons and materials. Presently based in Lithuania, she also covers a broad spectrum of regional security issues, including assessing NATO’s security assurances in the changing geopolitical context. Her analyses have been published in the Bulletin of Atomic Scientists, Arms Control Today, the Middle East Journal, Peace and Conflict Studies Journal, and Lithuanian Annual Strategic Review. Ms. Murauskaite has also developed courses, workshops, and other training curricula (online and in person) for professionals and academics, exploring different aspects of CBRN-related threats.